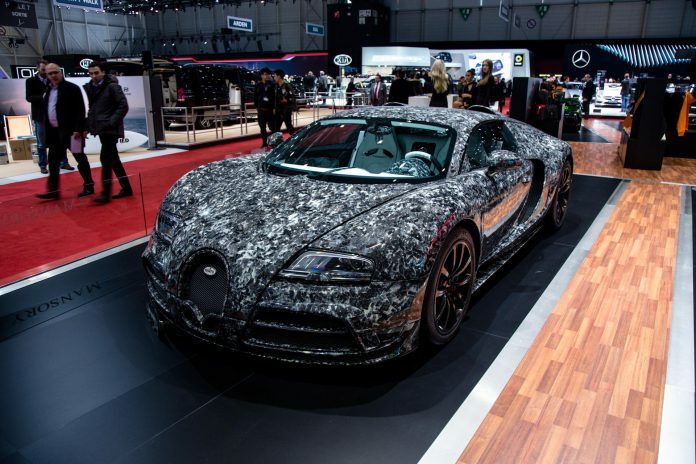 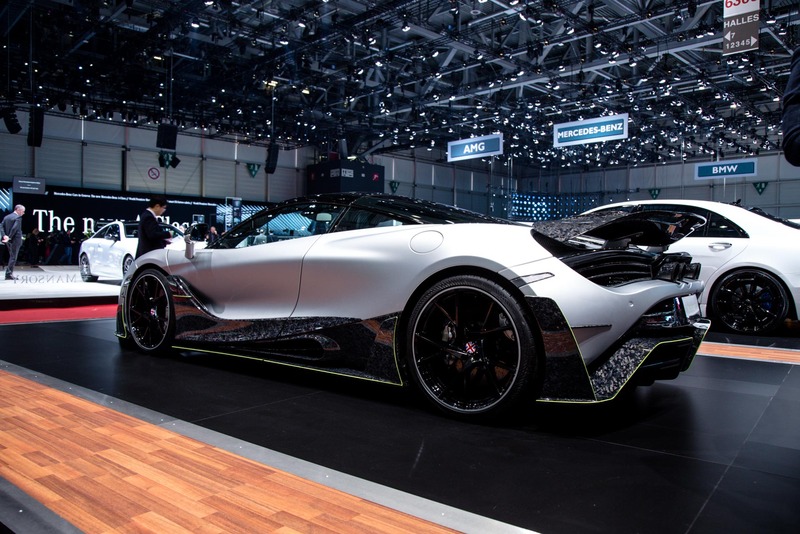 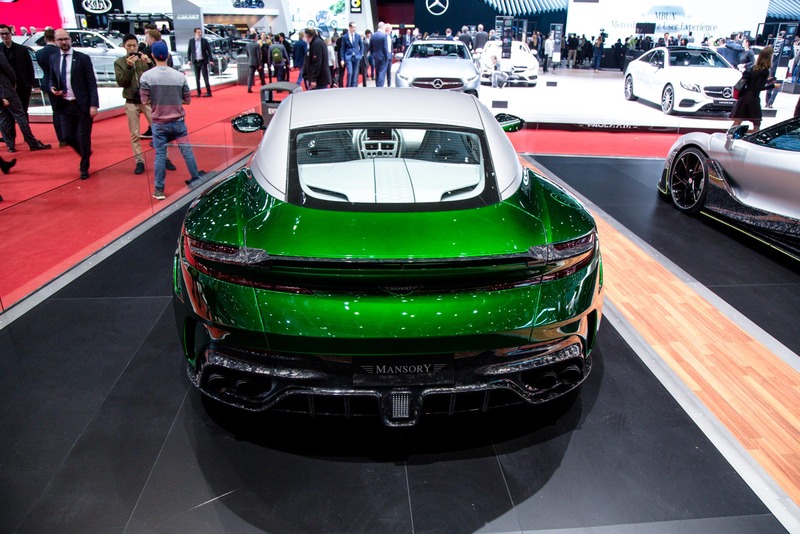 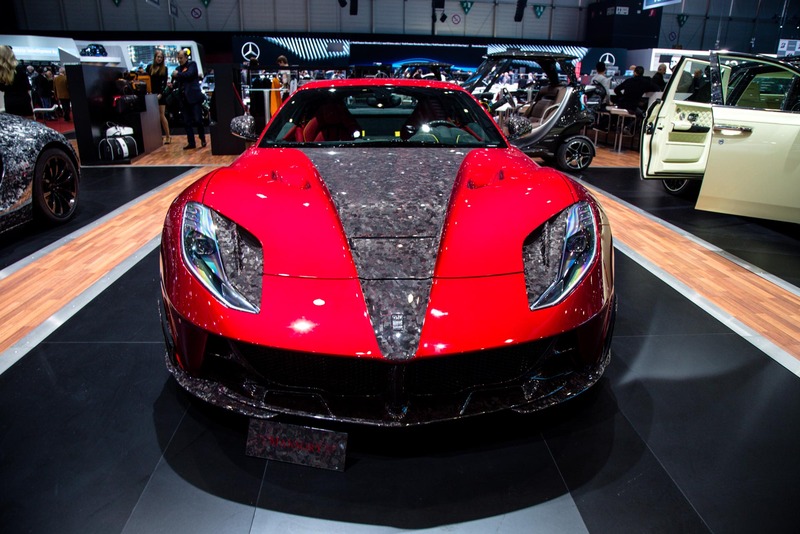 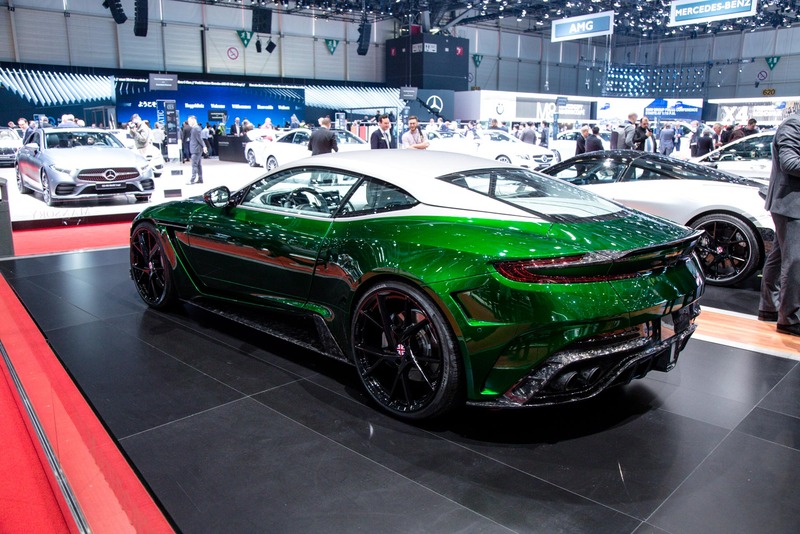 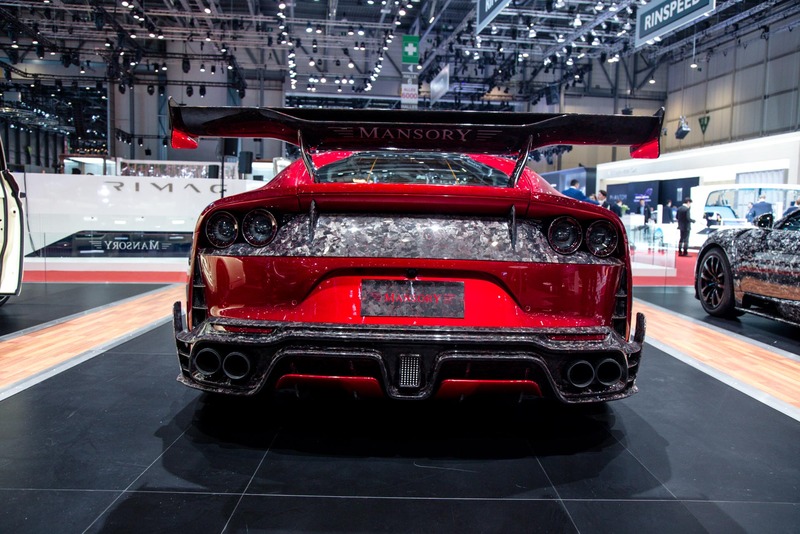 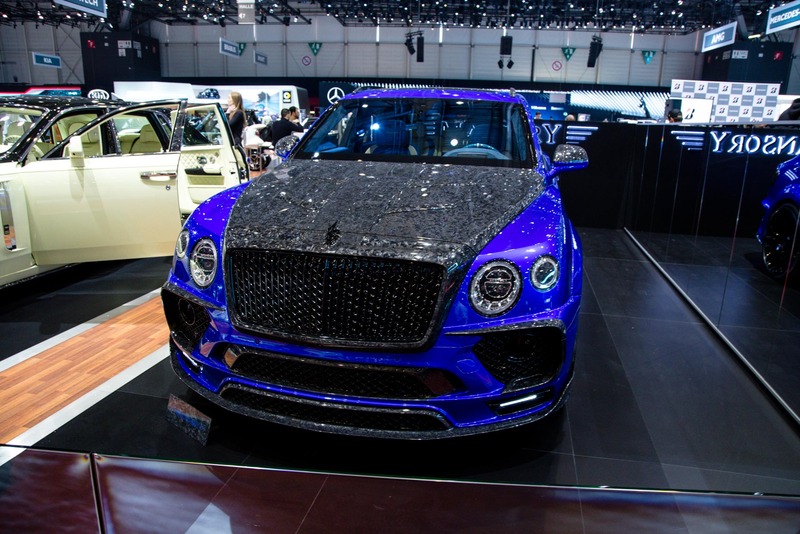 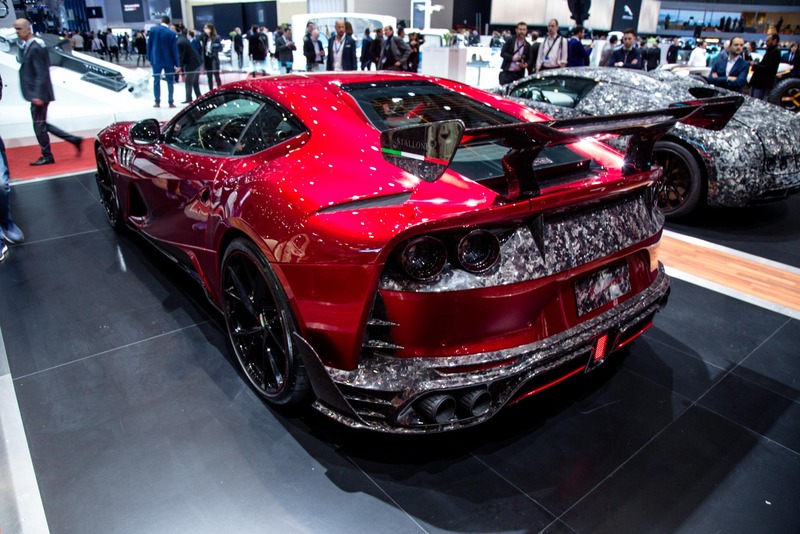 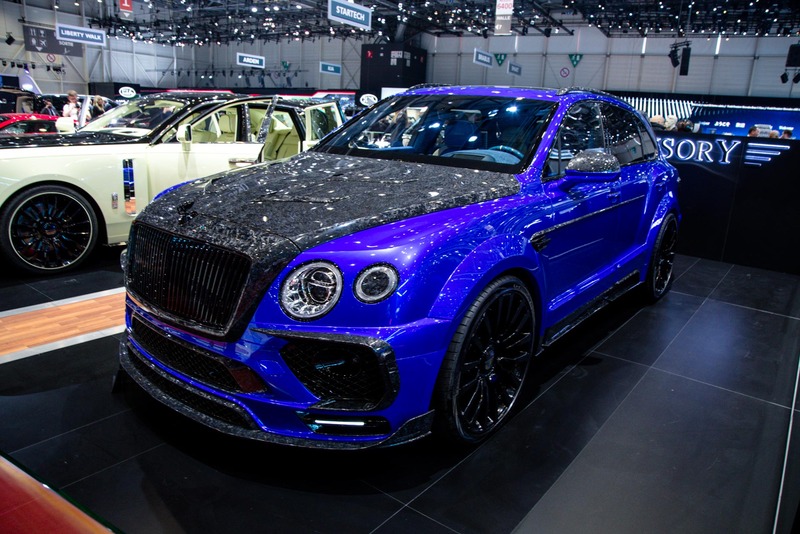 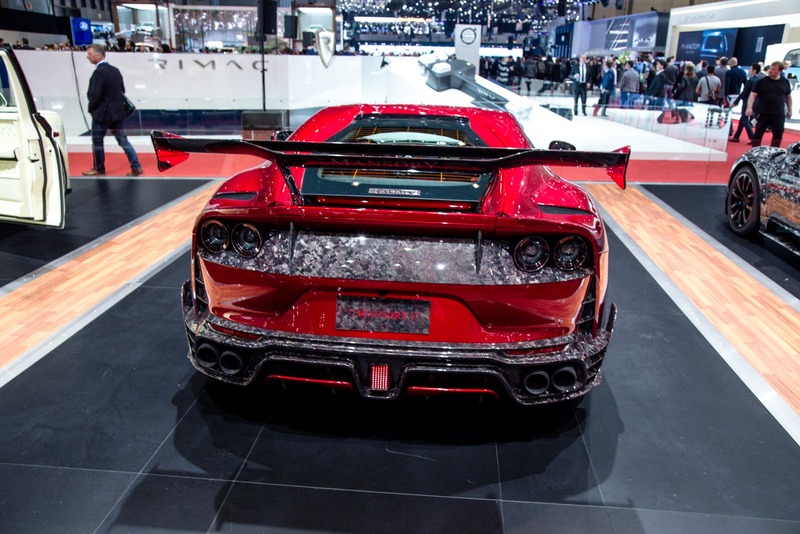 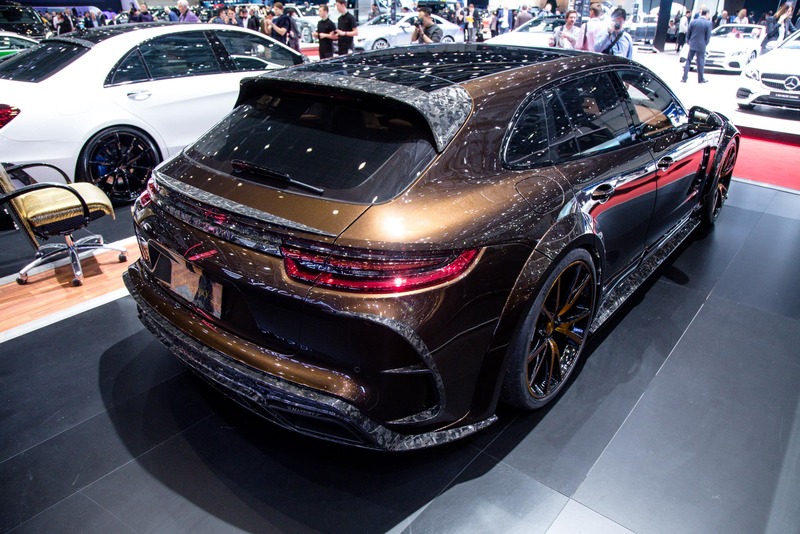 Mansory always create a talking point at the Geneva Motor Show. 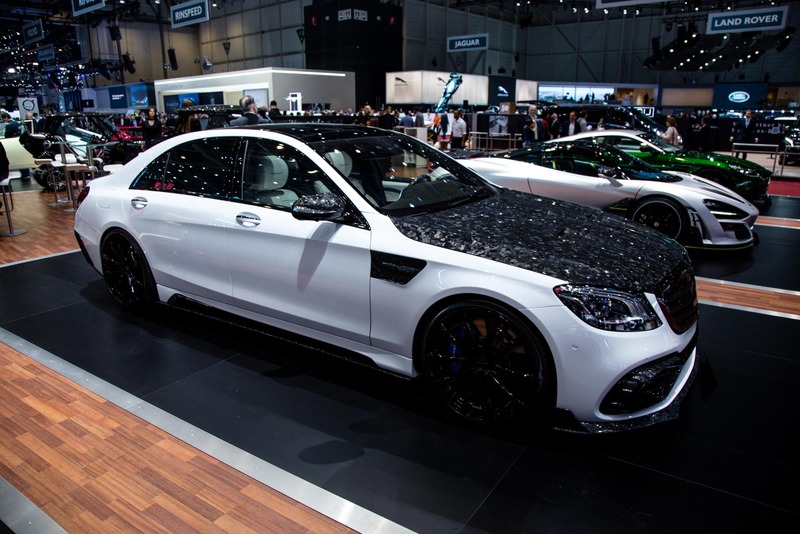 This year’s show is no different. 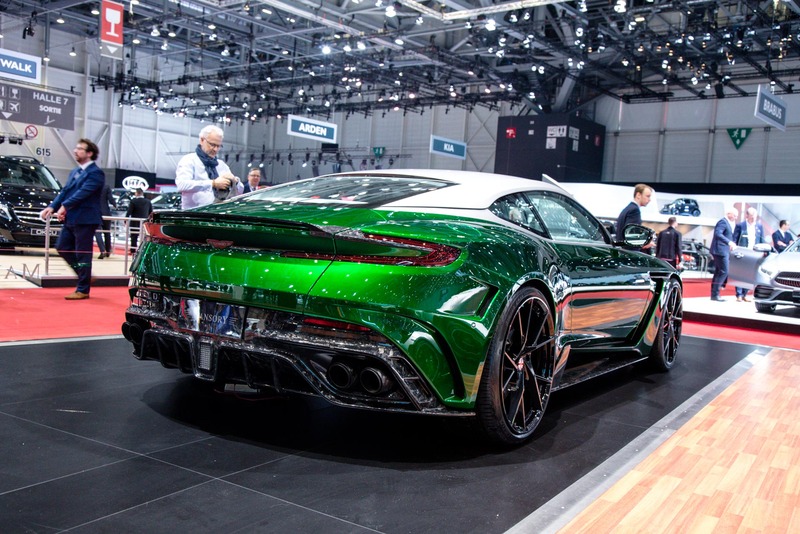 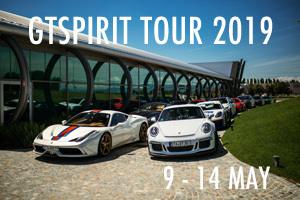 There are tuned Veyron’s, Ferrari’s, the latest Rolls-Royce and the McLaren 720S. 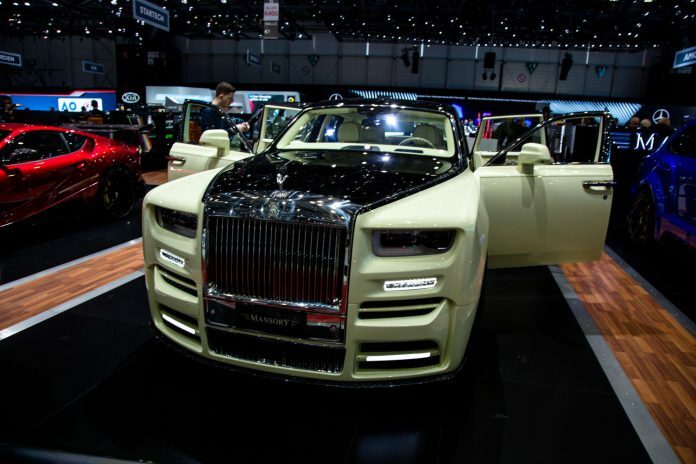 It’s a what’s what of the latest supercars and hypercars all with some form of weird and wonderful modification! 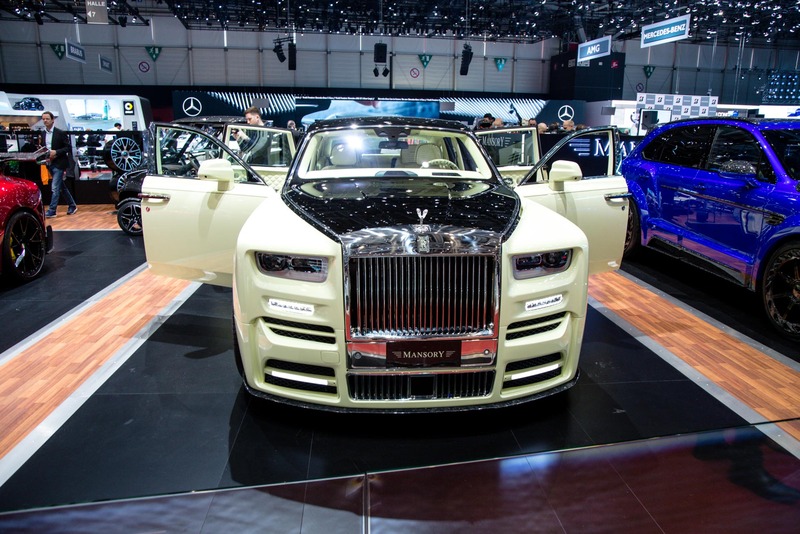 The Phantom has been on the market for such a short period of time it seems incredible that Mansory could customise one so comprehensively. 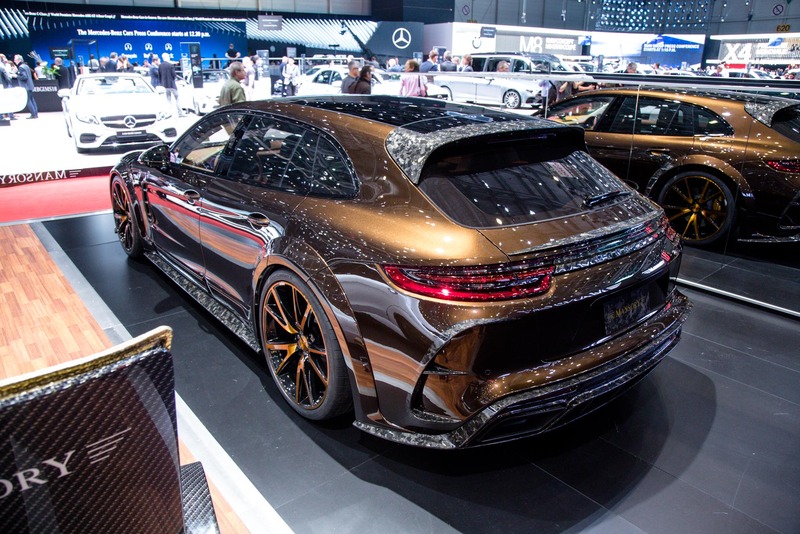 Yet they have! The facelift Phantom has received its first tuning package pushing power to 610 hp and adding a bespoke colour and bodykit! 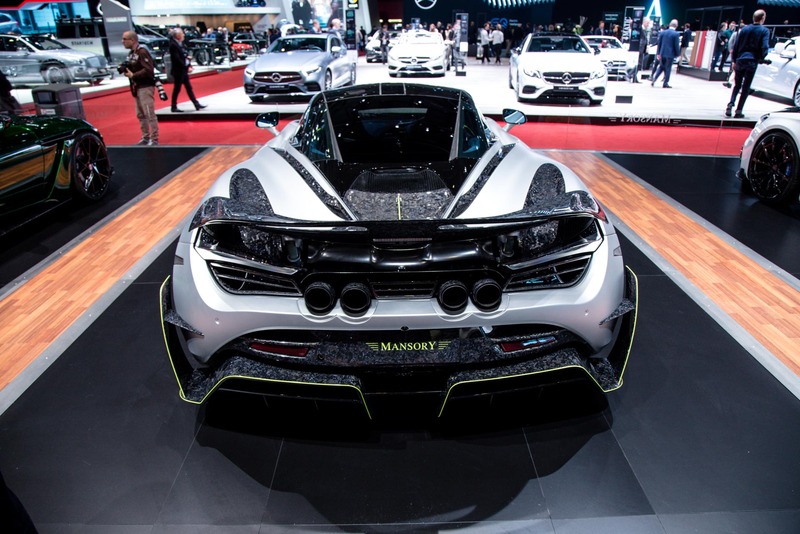 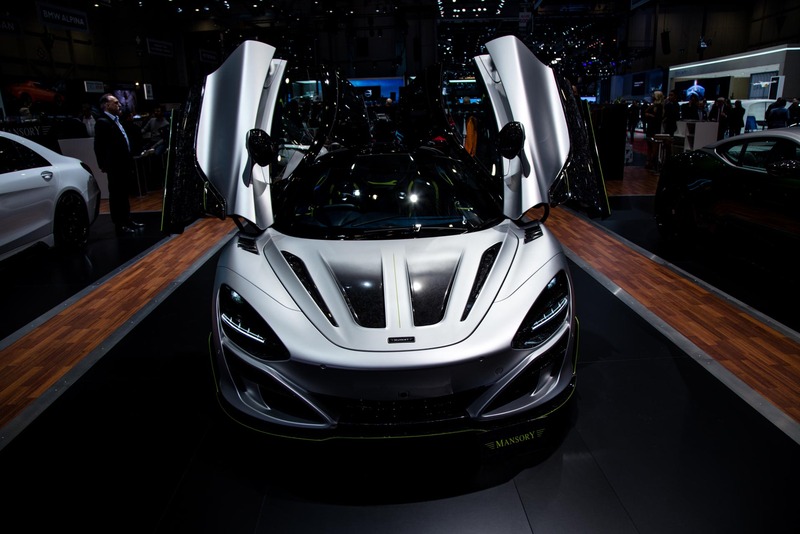 The McLaren 720S receives a huge amount of carbon composite parts ranging from a redesigned front end with P1 style nose intakes, wing extensions and side skirts. 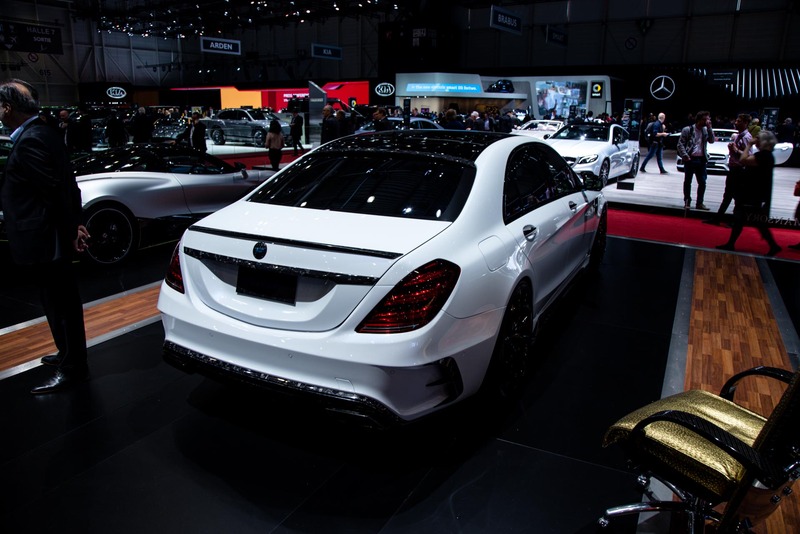 At the back, the rear gets a new aggressive diffuser and a rear wing. 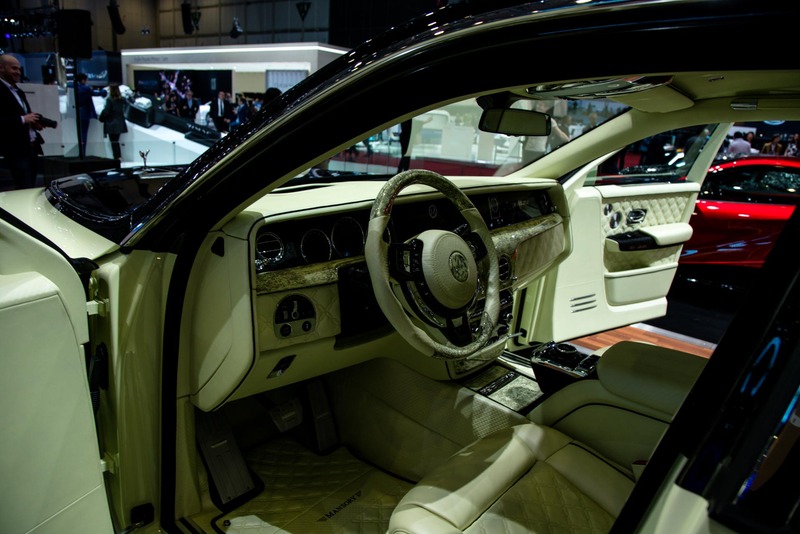 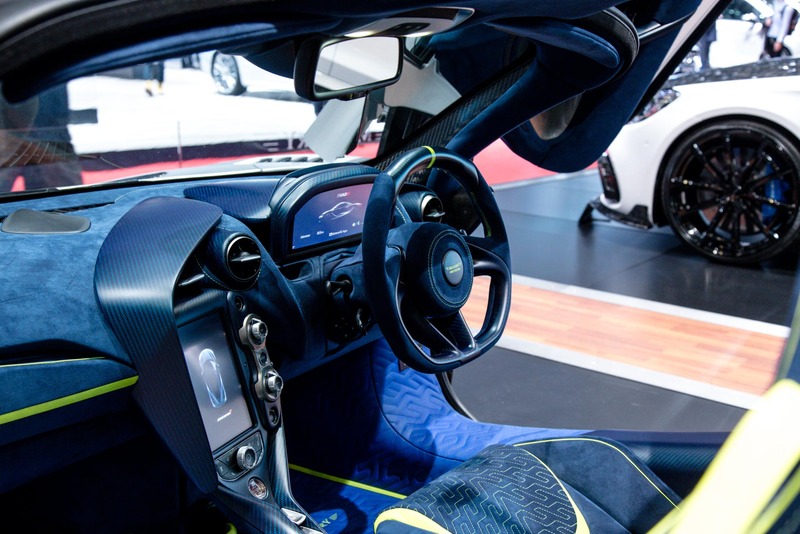 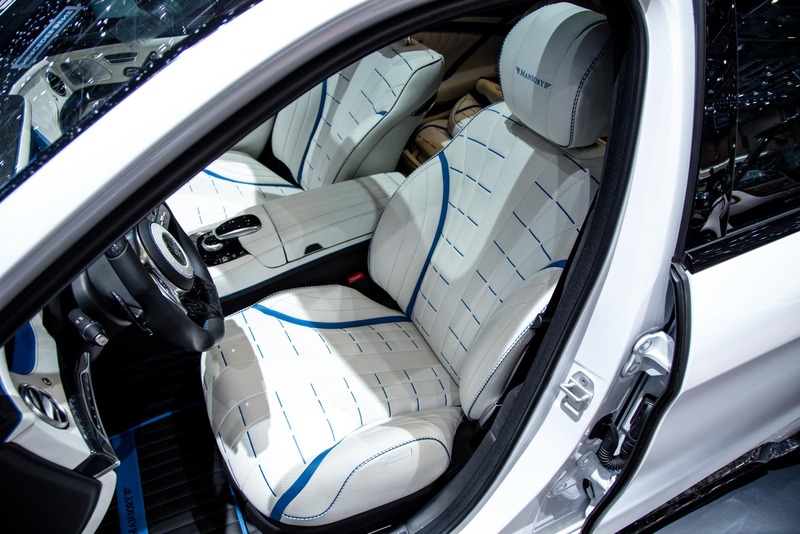 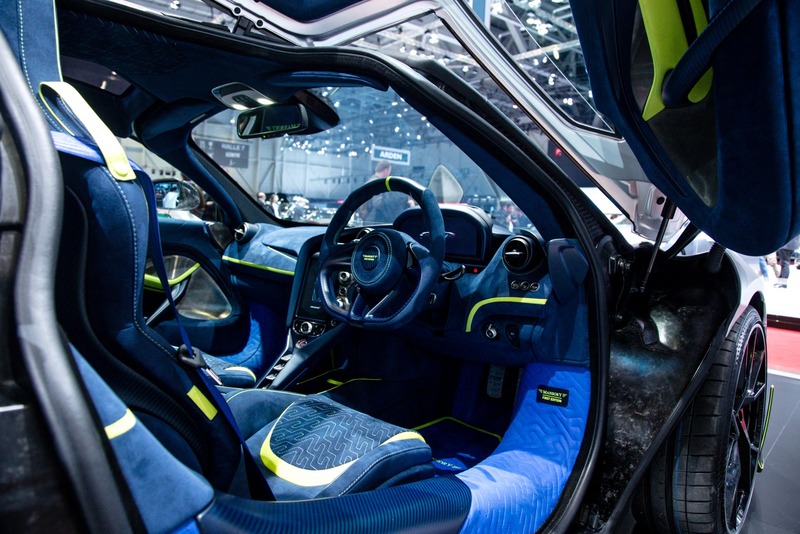 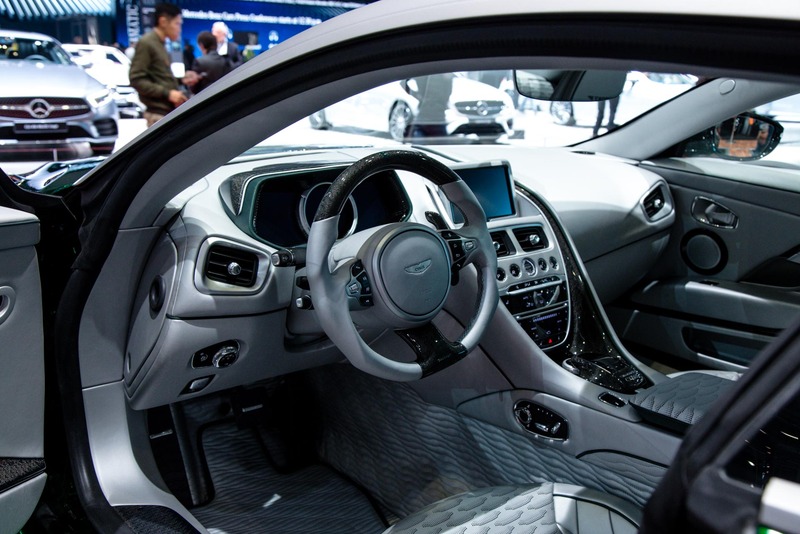 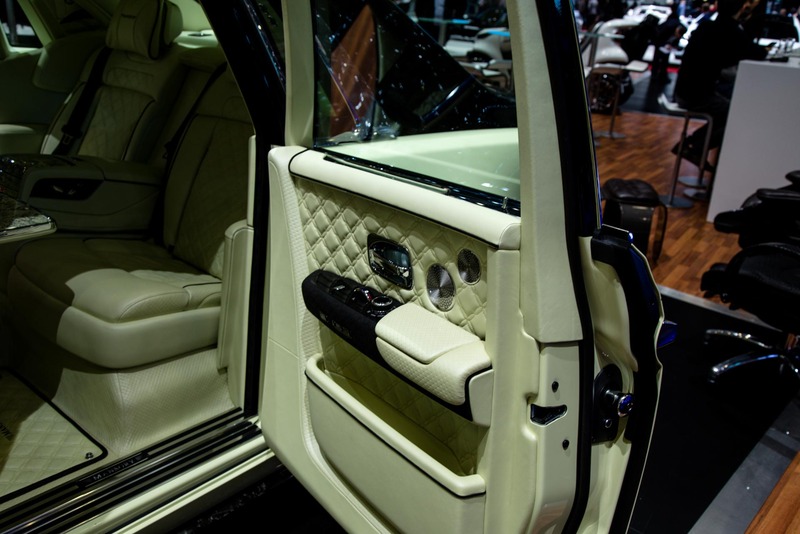 The interior is completely new, upholstered in a unique Mansory design. 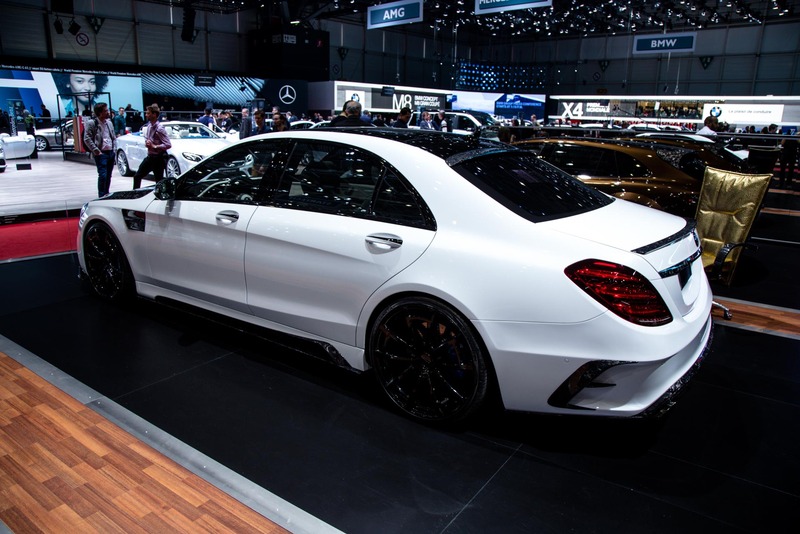 Engine power has been improved by optimizing the engine management software and adding a special exhaust system. 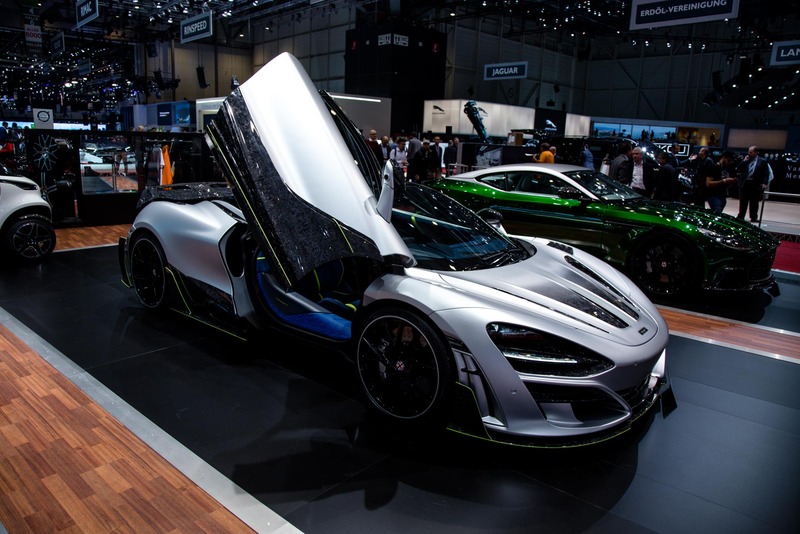 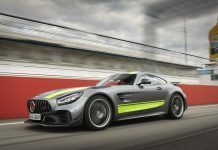 Power is increased to 755 hp at 7,300 rpm and 780 Nm at 5,600 rpm, from 0 to 100 km/h happens in 2.8 seconds and the top speed is increased to 345 km/h. 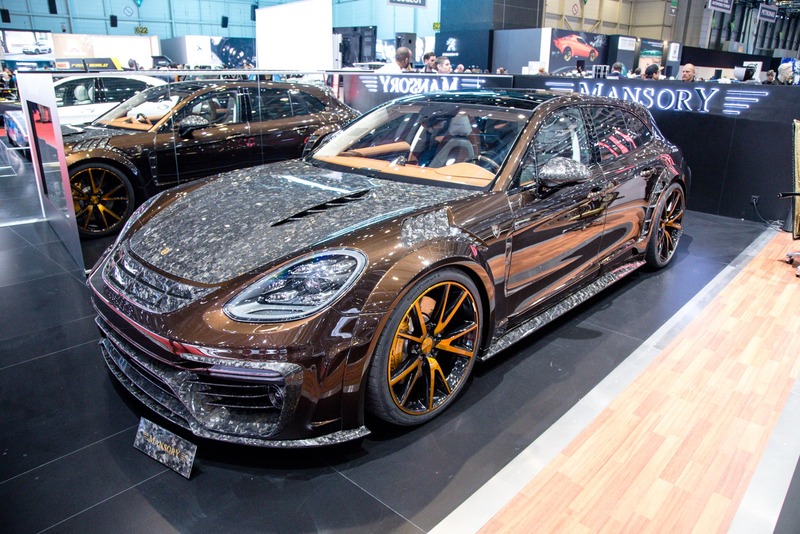 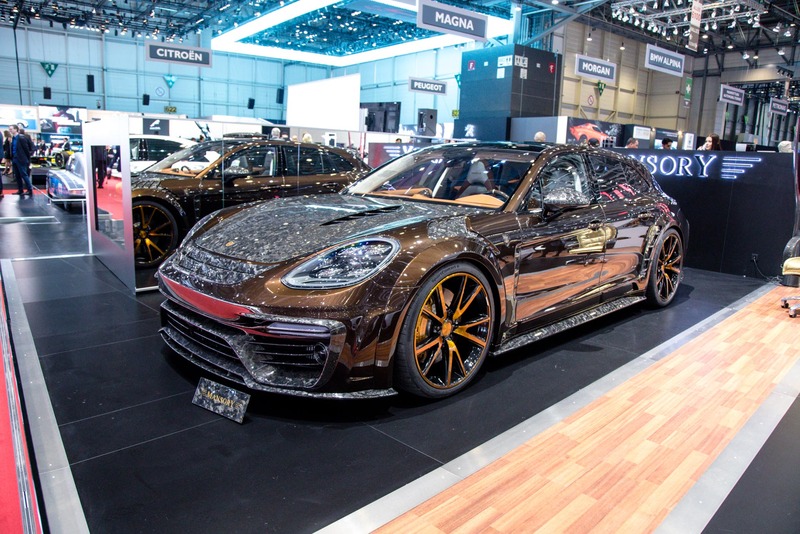 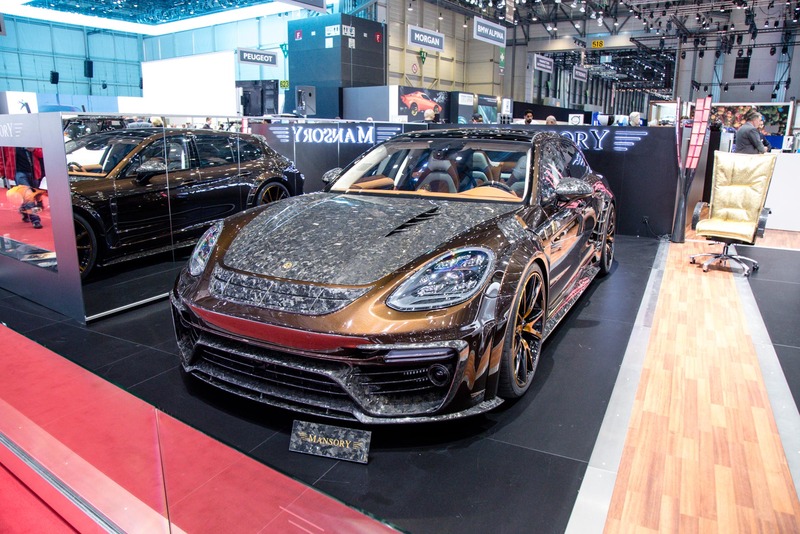 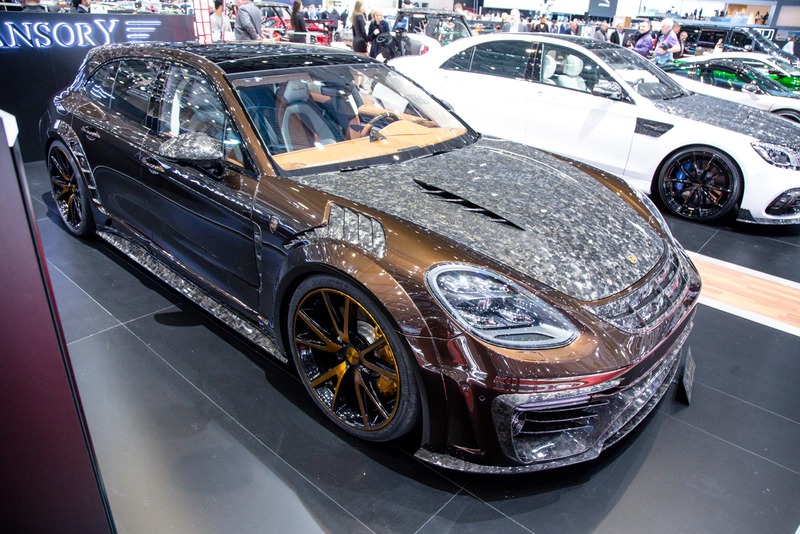 Mansory’s take on the Porsche Panamera Sport Tourismo adds a new front splitter and intakes, vented hood and fenders, side skirts a two-piece roof spoiler and a diffuser. 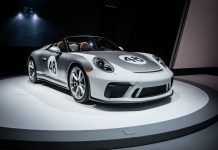 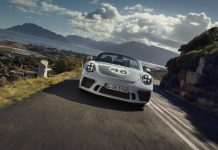 The Porsche also benefits from an optimized control unit, a sports air filter, and a high-performance exhaust system pushing the twin-turbo V8 performance up by 35 hp and 40 Nm of torque. 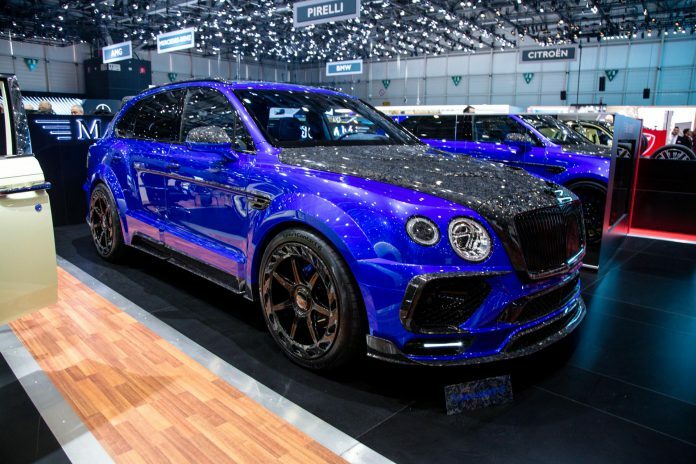 The new Cyrus is not quite as extreme as the old one! 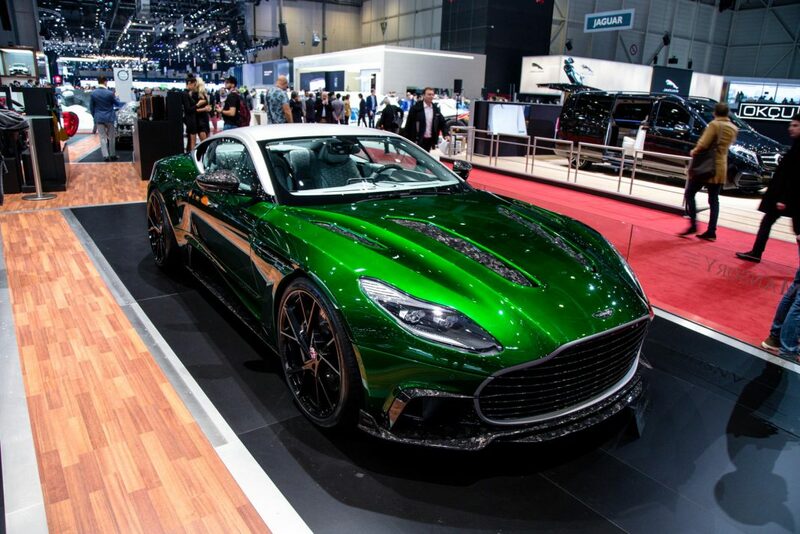 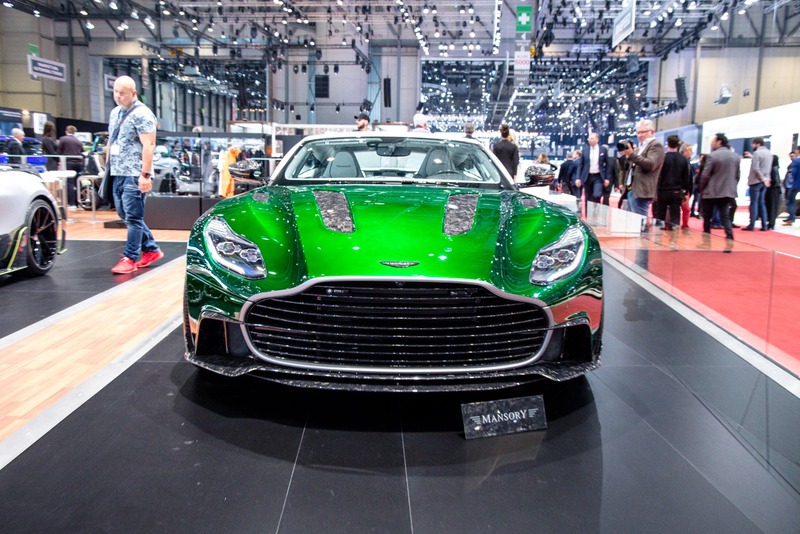 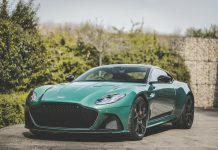 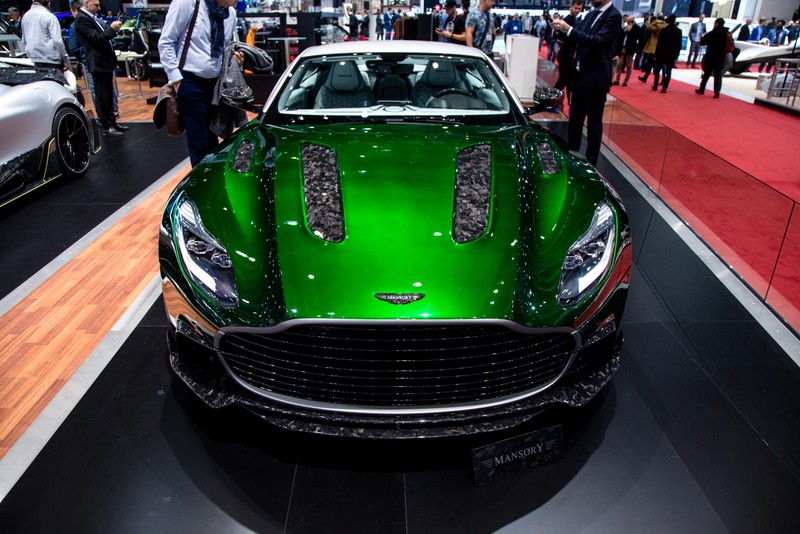 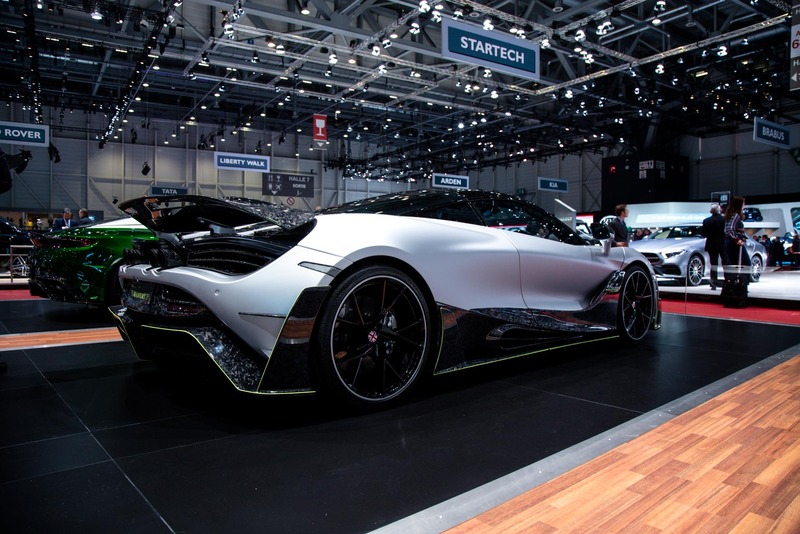 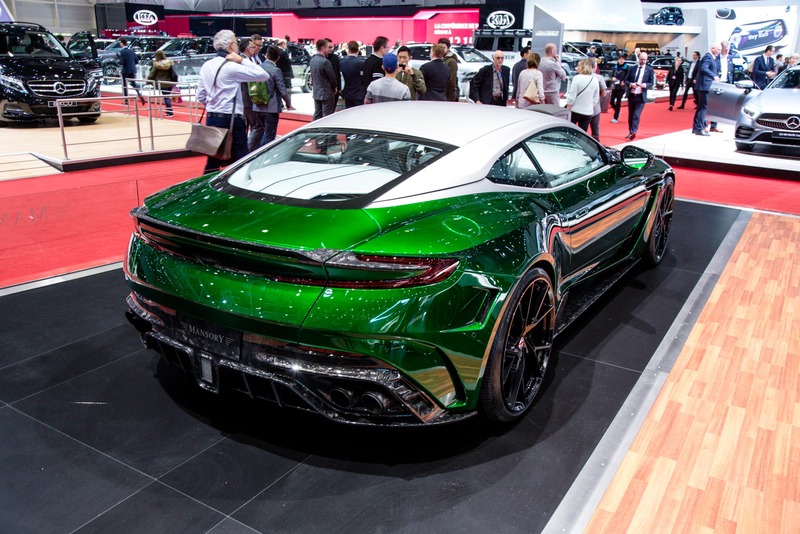 It is based on the Aston-Martin DB11, it gets a new carbon fibre front fascia with a more aggressive front splitter, larger air intake and multiple vents in the custom hood. 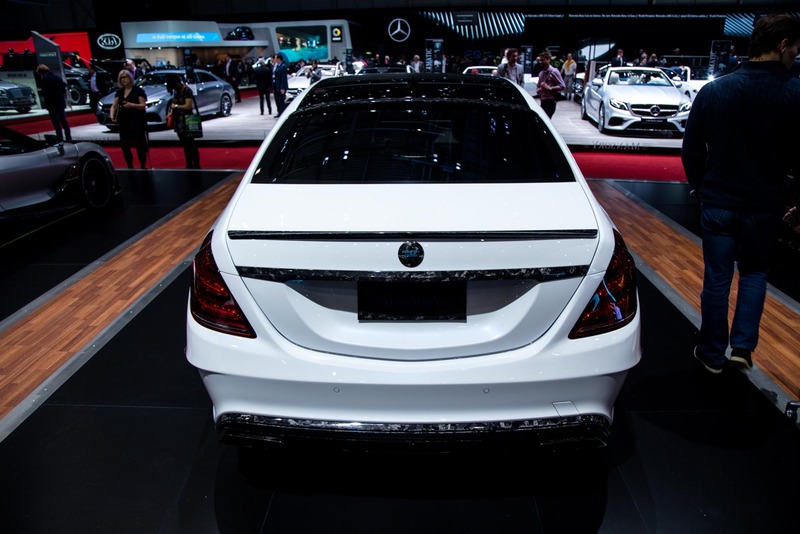 New side skirts, a carbon rear evacuate hot air from the engine bay. 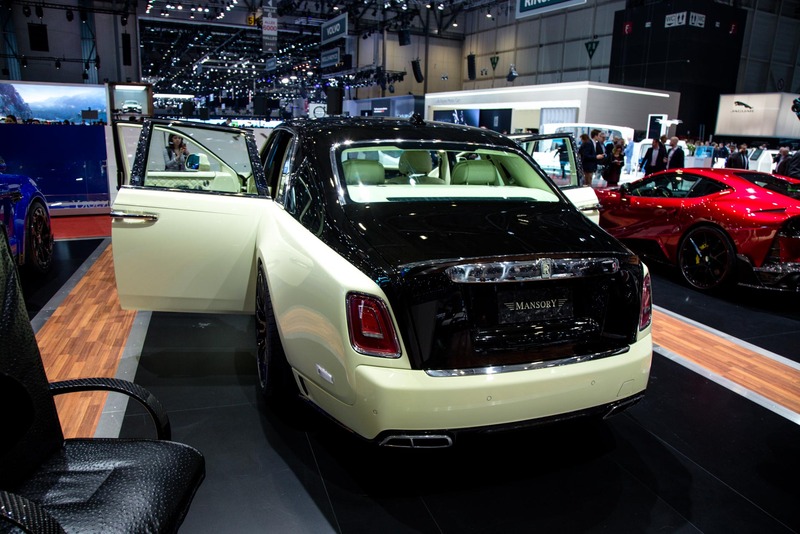 New side skirts give the Cyrus a lowered, stretched appearance. 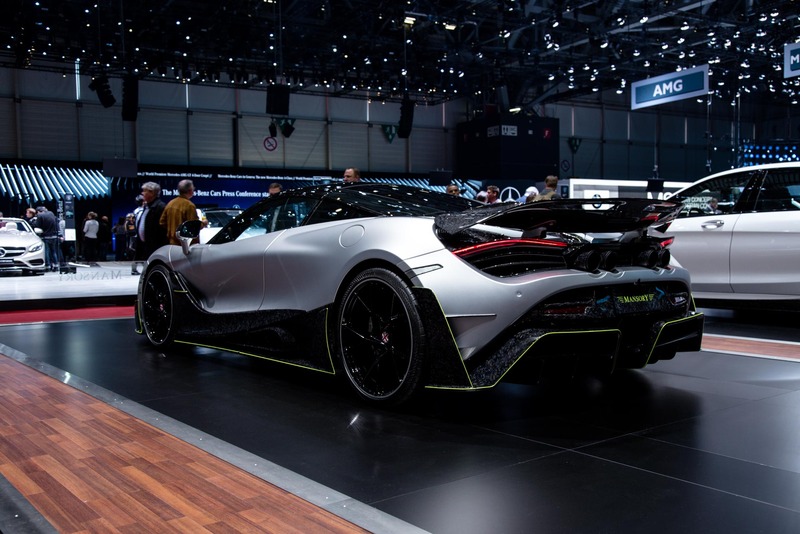 At the back, a large carbon fibre wing and new rear fascia and huge diffuser help develop more downforce at the back of the car and nicely frame the rear exhaust outlets. 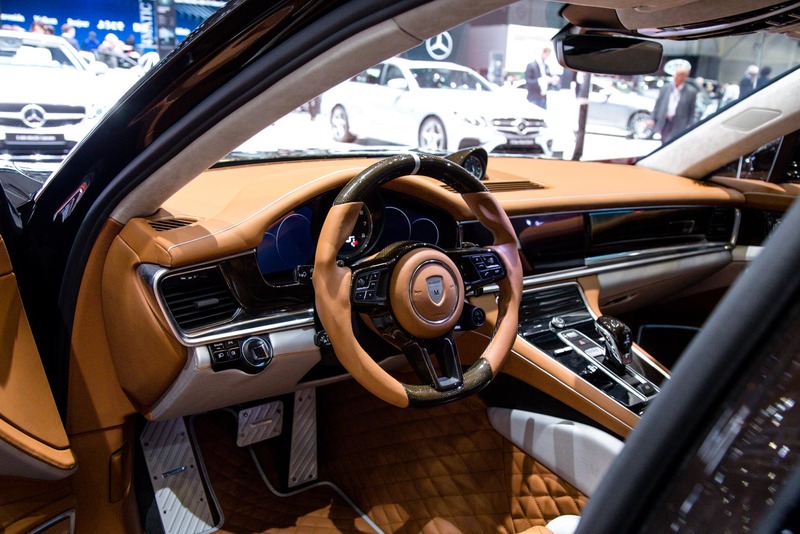 The engine has a new mapping system. 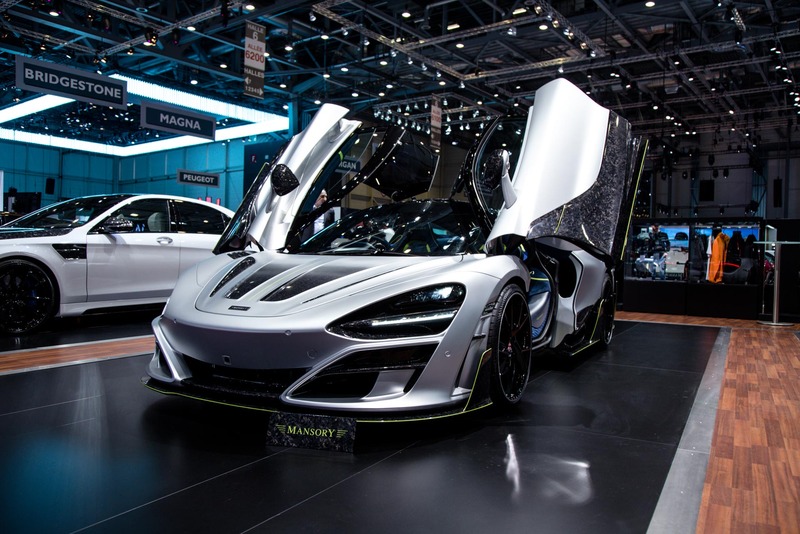 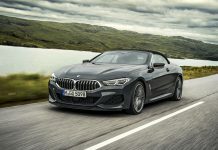 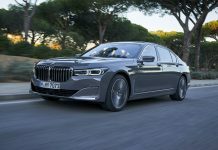 In conjunction with a new stainless steel exhaust system and low-restriction air filter that produce an incredible engine sound, it allows the twin-turbo V12 to reach a peak output of 700 hp (515 kW) and 850 Nm of torque between 1,500 – 5,000 rpm. 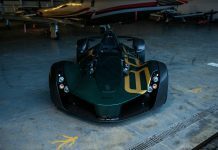 The additional power allows the 2+2 to reach 100km/h in 3.6 seconds. Its new top speed is 330 km/h. 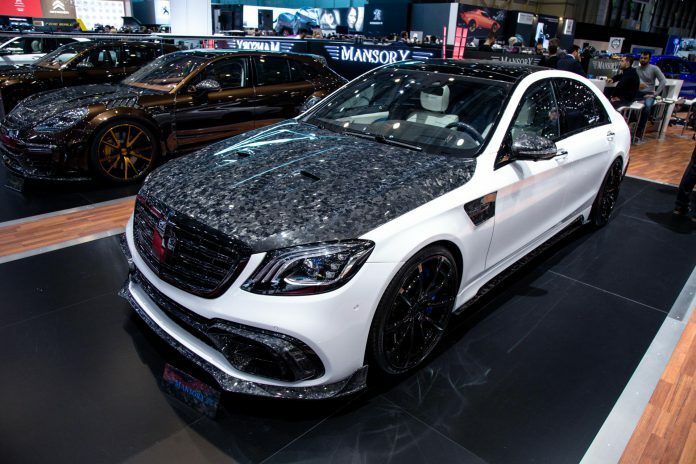 How Mansory manage to create a bespoke bodykit so quickly is anyone’s guess. 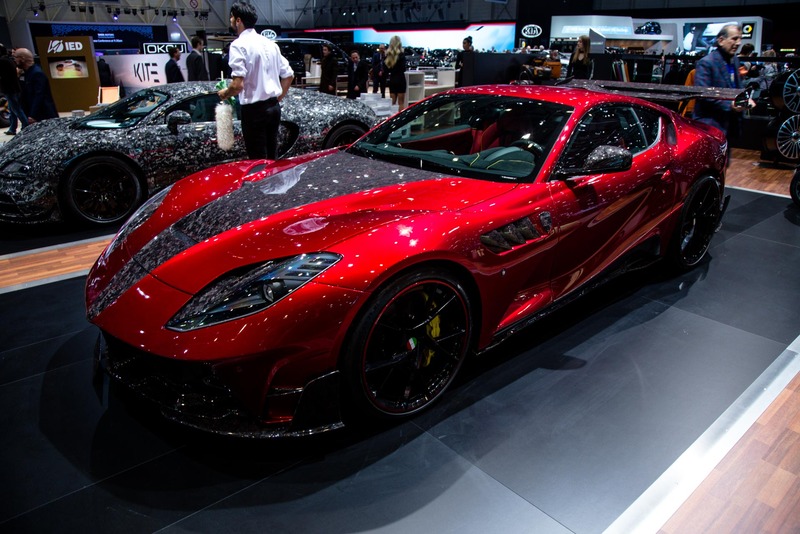 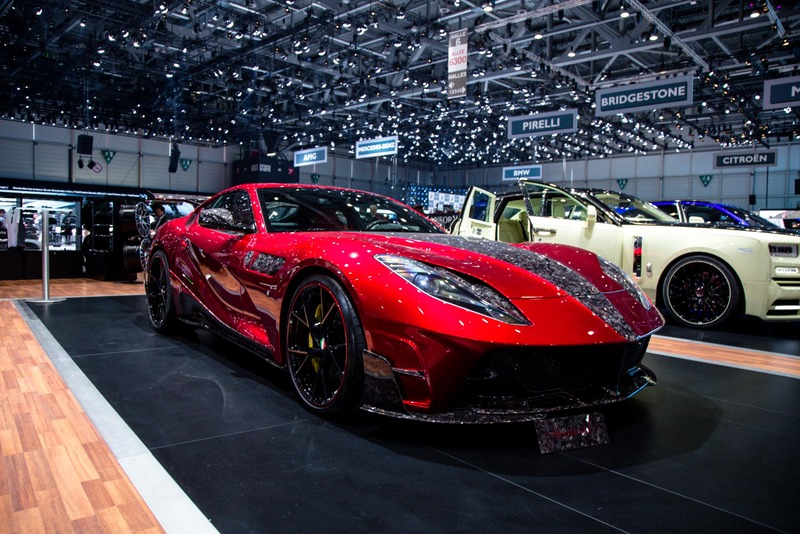 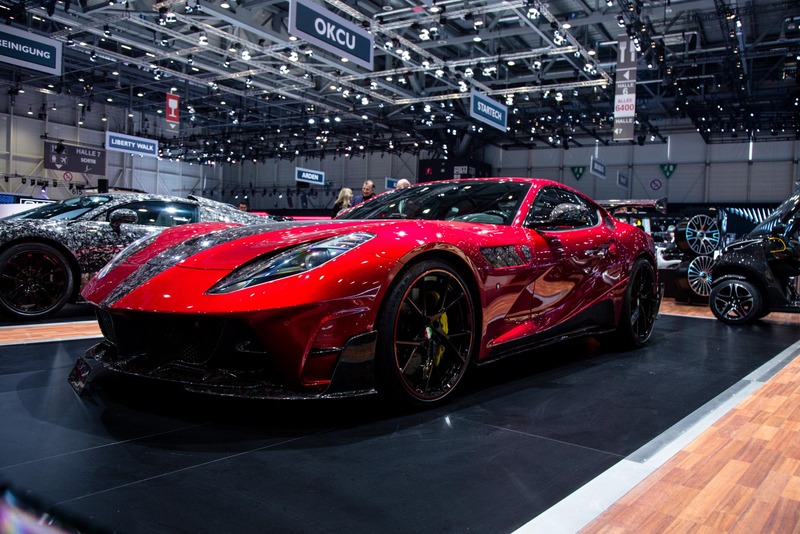 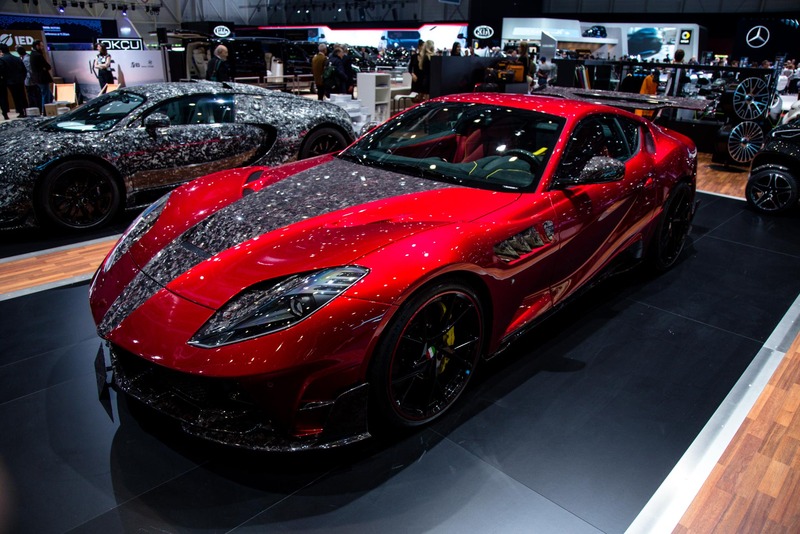 Star of their Geneva Motor Show display is a brand new iteration of the Stallone bodykit based upon the Ferrari 812 Superfast. 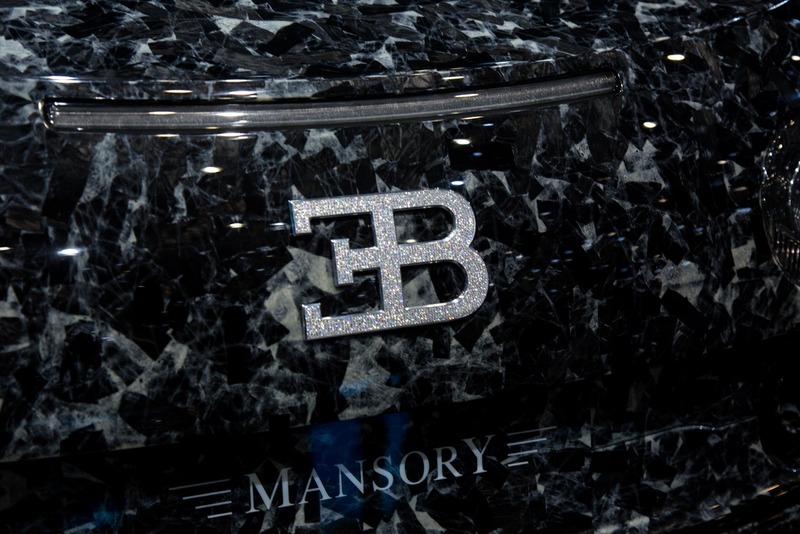 In true Mansory fashion, the carbon fibre components turn the visual impact of the Stallone up to ’11’. 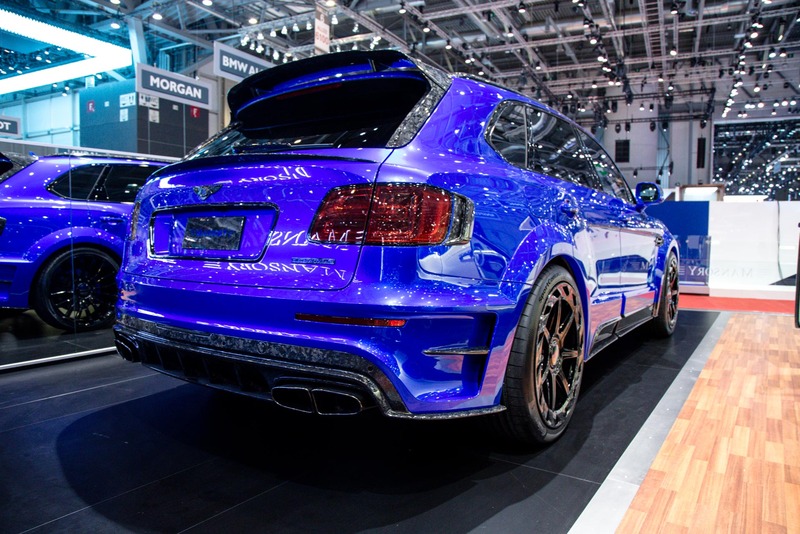 A deeps front splitter and a massive rear wing create an extreme look. 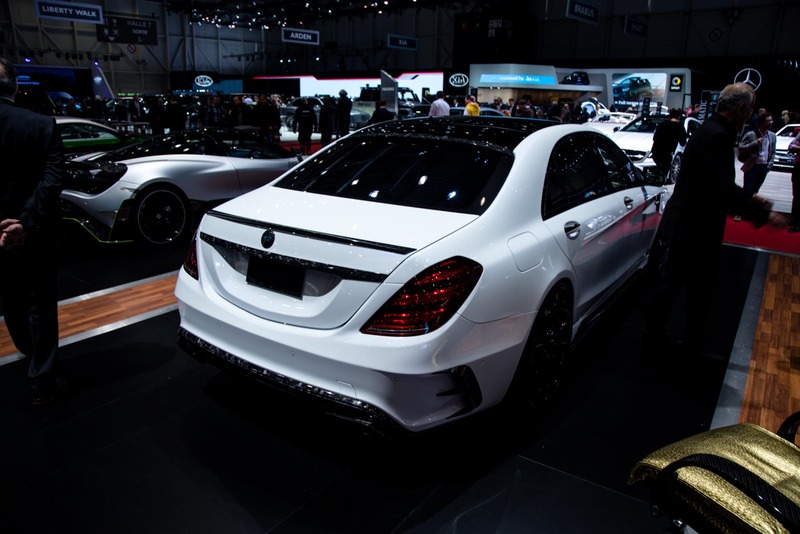 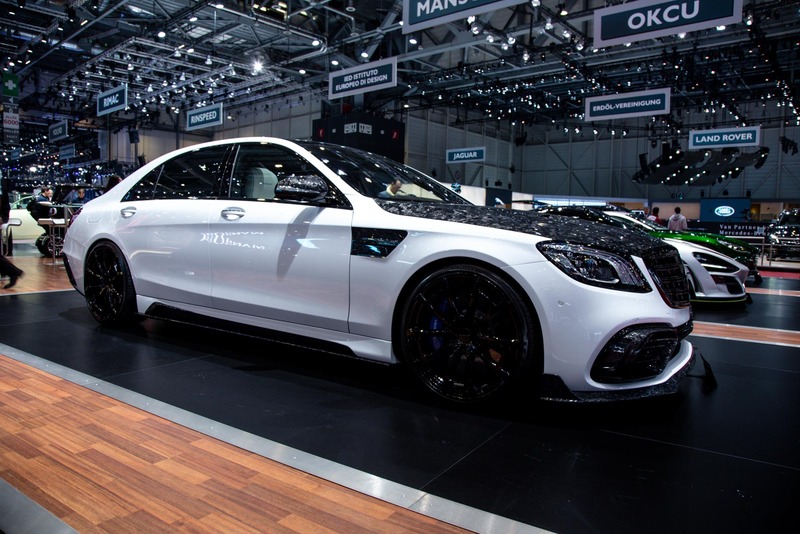 Mansory also promise performance updates, although these have not yet been finalised. 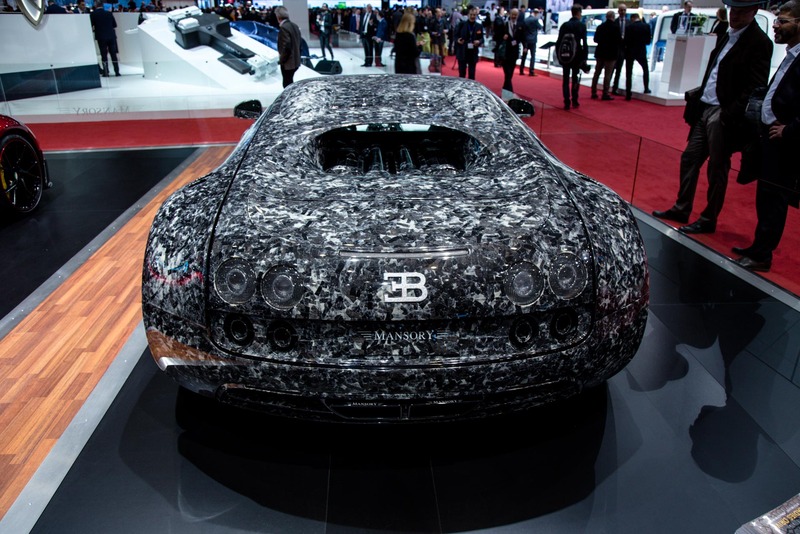 The carbon composite Bugatti Veyron 16.4 “Vivere Diamond Edition by Moti” has been controversial with its carbon composite body transplant. 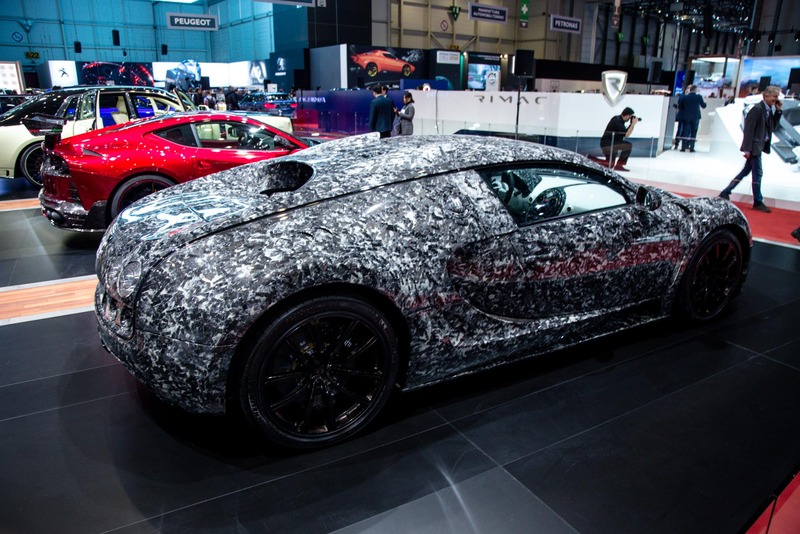 The bodywork has been completely replaced with a marble-effect Vivere bodykit. 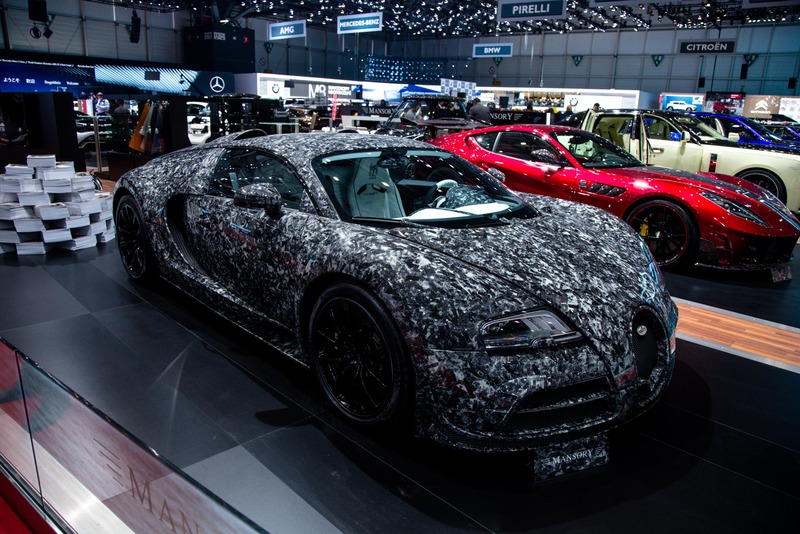 This particular Veyron was comissioned by a Mansory customer. 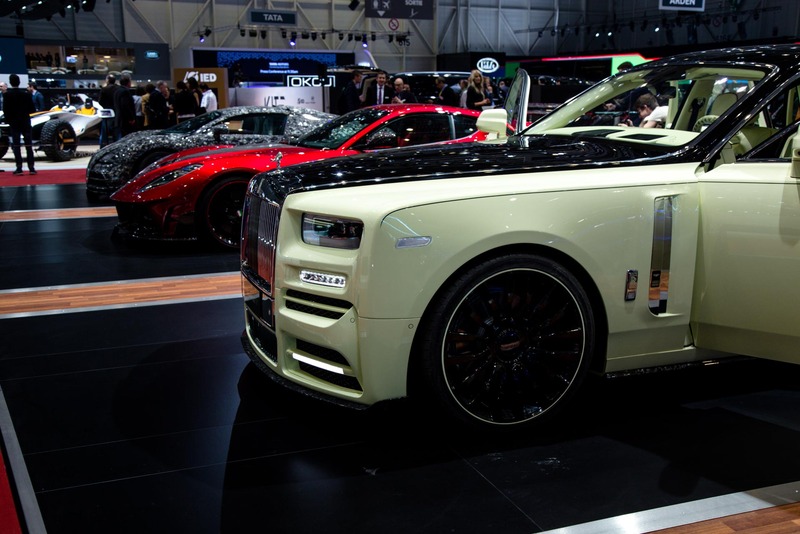 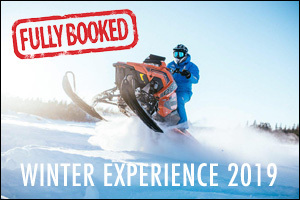 It will be a one-of-one bespoke project!